"It is no prisoner. It is here with a purpose." 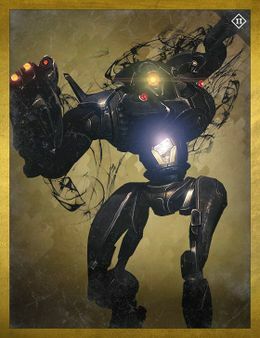 Qodron, Gate Lord is a Vex Gate Lord and the boss of the Prison of Elders challenge The Forever Eater. Unlike the other prisoners, Qodron and its minions came to the prison deliberately, foreseeing a glorious future for itself that could only be achieved by killing a "Light" (possibly the Guardian) that was destined to appear in the prison. Qodron itself is fairly similar to Zydron, Gate Lord in that it has a weak spot in its chest and mainly uses its Torch Hammer to attack. However, it also uses the detainment ability used by the Templar, and will detain all three guardians every 45-50 seconds. These detainment bubbles can be destroyed but take a bit of firepower and will drain the health of any Guardians inside, although there is a Goblin roaming around the arena called Qodron's Eye, which, upon killing it, grants that person the Jailbreaker buff, allowing them to destroy detainment bubbles more quickly. This buff lasts for 30 seconds and will only be granted to the player who killed the Eye. Qodron is the second Gate Lord to appear, the first being Zydron, Gate Lord. Qodron emits a dark gas from its body, similar to the Eschaton Mind, Imminent Mind, and Primeval Mind of the Sol Progeny. Qodron and Zydron are the only black Vex so far. Despite Qodron's Grimoire card picture having him in the stance of a regular Minotaur melee attack however, Qodron never attacks like this as his melee is a temporal shockwave.